Town of Truckee "Mousehole" on SR 89. The Town of Truckee has received $1.5 million in funding for the State Route 89 “Mousehole” project. The mousehole is a narrow railroad undercrossing that is hazardous for bike and pedestrian traffic. Truckee has been trying to obtain funding to widen the undercrossing for years. The latest funding comes from the U.S. Department of Transportation’s grant program called “TIGER”. Tiger is the Transportation Investment Generating Economic Recovery discretionary grant program, created in 2009 as part of a stimulus package for economic recovery. The total cost for the Mousehole project is estimated to be nearly $12 million dollars. The widening project plans are underway and the Town hopes to be putting the project out to bid in the summer of 2014, with construction starting in 2015. 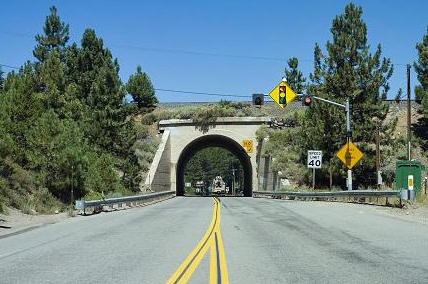 The current SR 89 undercrossing is a 25-foot wide concrete arch that was built in 1928. There are no shoulders through the tunnel, forcing pedestrians and bicycles to use the traffic lanes. Traffic often “bottlenecks” at the underpass during periods of peak use.